Many content strategists today use the three persuasive appeals from Aristotle’s Rhetoric : logos (reasoning), ethos (ethic), and pathos (emotion) as a framework. These modes are a good starting place to help people learn how to persuade on the web, but another aspect of Aristotle’s Rhetoric is even more elemental: the notion of learning your audience and using this knowledge to craft more effective, persuasive messages. This doesn’t just affect how you write and which types of logos, ethos, and pathos you use. Perhaps more importantly, it defines what you write. When you learn what your audience needs to know, it simplifies the problem of what content to create and when to create it. Most approaches to understanding digital audiences center upon learning about visitors to your site through web analytics, site search analytics, user research, or user surveys. These ways of learning your audience are of course important. But they limit your understanding of the audience to people who have found your site. What about all those people who haven’t found your site yet but who are in your target audience? In marketing, we call these people prospects. If you market just to the people who already know about your site, you are marketing to your existing customers, rather than prospects. The only way to grow your business is to market to prospects and entice them to become customers. To address this need in my work at IBM, I’ve developed a methodology called “outside-in content strategy,” in which you analyze what information your audience needs by looking at the words and phrases they query in search engines, and then you build content to suit their needs. How much do we know about our audience based on their keyword usage? Not enough to create a content plan without prep work. You still have to build fictional personae—based on known traits or audience patterns—and ask yourself what those people are searching for before you start doing the keyword research. For example, we use personae for IT managers and Chief Whatever Officers (CXOs) a lot at ibm.com. Once you have detailed personae, you’d be surprised at how much you can learn about their information needs by doing deep keyword research. When you understand audience information needs, you can add a keyword column to your content audit, uncovering the gaps and overlaps in your existing content footprint by keyword. Then you can build an editorial calendar around what your audience is looking for through search. This helps us with the whole content lifecycle—creation, curation, updating, and retirement—though for now, I’ll just focus on creation. At IBM we prioritize content creation by looking for the top audience pain points for which we do not have content. We identify those pain points through keyword research. We don’t just analyze audience keyword usage for the topics they’re looking for, but also for the tasks they want to complete. Audiences are getting increasingly sophisticated in their search query grammar. We mine this grammar to learn what their top tasks are when they land on our pages from search. That helps us create user experiences they will be inclined to engage in. Okay, so that last bit might seem like a whirlwind of activities with which you’re not entirely comfortable. Allow me to break it down into a step-by-step process. Ask yourself who you want to attract to your site. What would an ideal prospect look like, act like, and think like? What are their needs? How does your organization attempt to satisfy these needs? These are tough questions that might force you to think about the nature of your job and its role in your organization. Chances are, if you haven’t already done this thinking, you are missing the mark with your content. The goal is to give life to the people you’re trying to communicate with so that you can better serve them. Give your personae names, interests, and pain points. Go beyond mere job roles to get inside their heads. You probably need to read what they read to learn their particular subset of the English language. If you know your target audience well enough to construct fictional personae, you will know a rough landscape of keywords they search on. Start with nouns or topics. Pick 10 of the most important nouns for your personae. Ignore brand names; focus on big-picture concepts. For example, if the topic is smarter water management, keywords might include waste-water treatment, water quality monitoring, water conservation, etc. This basic tool gives you local and global demand for your words and tens of related words. I recommend putting your seed words in one at a time, outputting the results to Excel, and removing duplicates. If nothing else, this tool will tell you what not to use, and it should give you a good cloud of words to look for. One often missed step here is removing false positives. To do this, you have to click the words in AdWords, which will take you to their search engine results pages (SERPs). You will know at a glance if the SERP is relevant to your target audience or not. If it isn’t, delete the word from your spreadsheet. This tool will show trending data on two or three strings of words that AdWords identified as having high demand. This helps you see longer term how the words are doing and what media events have affected demand. At some point, you have to start typing the words into Google and seeing what related phrases come up in the drop down. Many of these will not be in AdWords for some reason. It’s important to see these phrases because they represent the grammar of actual queries. Your end goal is to learn the query grammar of your target audience and deduce content plans from it. When you type these queries into Google, click the results for all the sites that rank on the first page for that word and take notes about the content you find on their sites. Obviously, you don’t want to copy them, but there is no substitute for this kind of competitive analysis. Note pages for high demand words that are relevant to your target audience but appear to have low competition. These are your top opportunities to serve your audience’s needs in ways that are not currently served. Perform keyword searches in Wikipedia with your words and click on the article statistics links for each of your words. Here you will see trends and gain all kinds of semantic information about the relationship between your words and synonyms, antonyms, and other linguistic weirdness. Note this weirdness in your Excel spreadsheet. It will come in handy later. In particular, look for verbs and articles in the query logs. These can tell you not only the topics your audience is interested in, but the tasks they need to accomplish on your site. This process is recursive because it involves a lot of checking and rechecking with the same tools, as you gradually reduce the number of common queries you want to focus on to a manageable set—the most relevant to your target audience. There are several great books on how to audit content, so I won’t belabor the point—two favorites are Content Strategy for the Web , (2nd edition) and The Elements of Content Strategy —but for large organizations such as IBM, auditing is a bigger challenge than any of the books I’ve read make it out to be. It’s easy enough to search for content on your site related to the keywords you have identified for your target audience and catalog it according to some simple criteria. I mean, it’s not easy to do—it’s tedious and time consuming. But it’s not complicated. What is complicated is to create an audience-centric content audit. If you start with your personae and filter the content in your audit for audience needs and pain points, you might find that your audit missed the mark. You might find the content that surfaces on a simple search is not for your target audience. It might be nominally relevant to them, but it doesn’t serve their core information needs. When you start to discover these insights, you know you are on the right track. Log these gaps for later analysis. For example, say your site has 20 digital assets (pages, PDFs, videos, podcasts, etc.) related to the word “cloud.” Perhaps you already have 10 product pages, with four apparent duplicates, six support pages with two apparent duplicates and some how-to technical documentation about your company’s cloud offerings. What you lack is information related to common queries, such as “what is cloud?” or “define cloud.” When you look at your keyword spreadsheet, you’ll see these are very popular queries. Perhaps they type these queries a lot because your target audience seems to be confused about the concept. Perhaps each company that offers cloud solutions defines it differently. For whatever reason, it’s clear that your target audience needs this information and you should note in your audit the relative priority of providing it clearly. A content plan inputs all the gaps and overlaps in your audience-specific content audit, and uses business rules to output a list of strategic priorities for content. Not all of them will be the highest demand words identified in your keyword research. Perhaps you want to establish a niche that only addresses a portion of the pain points your personae have. If you start with the words they use, you’ll develop content that they can connect with regardless of your business strategy. Note that the content plan is not limited to web pages or even digital assets. In a perfect world, your keyword research informs all the ways in which you communicate with your target audience. This is especially important for any social content in your plan. This needs to be in synch with site assets so that social can be an additional referring engine for your site. IBM transformed its brand starting in 2008 with a concept called Smarter Planet. It started as a pure branding play for IBM—emphasizing its unique position to help large organizations solve the big problems in the world: population growth, food scarcity, clean water supplies, energy, etc. The challenge for content strategists associated with this effort is to help our audience bridge the gap between the language they use to describe their problems and Smarter Planet branding. 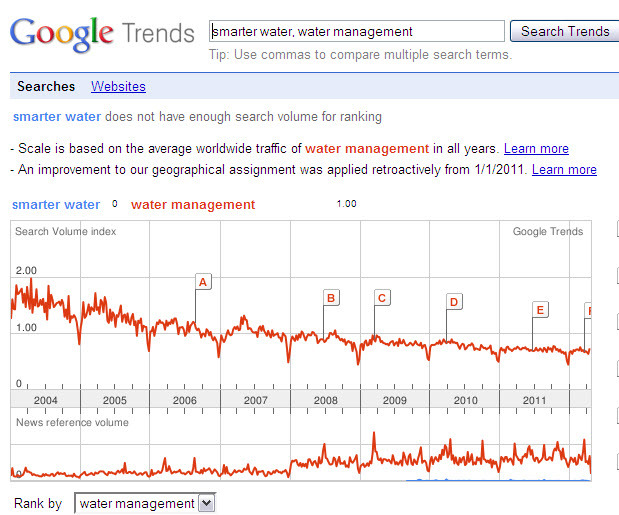 As a content strategist and search specialist for the project, I pulled the keyword research for the topic “smarter water” and this is what I found in Google Trends: below is a Google trends snippet of the term “water management” versus “smarter water.” Index of 1 = 200,000 queries per month world wide. Note that smarter water had insignificant demand even after we ran advertising around the term. As the graph shows, “water management” (the red graph) had a long history of good search demand—about 200,000 queries per month at the time I pulled the data (it now has 450,000 queries per month). There were other good candidates to consider, such as “water conservation” (200,000), and “waste water treatment” (650,000). But these were only relevant to a subset of the content we would develop. Smarter Water Management is about all the activities our target audience engages in to provide clean water for their constituents. Ultimately, we built the experience from the URL up using the term “water management” instead of “smarter water.” We bridged the gap on the site by calling the page “smarter water management,” which made the brand people happy while helping to turn our web property into one of the most successful in ibm.com. The first success was evident in search: we become the first commercial site on the first page in Google for the term water management (a page dominated by groups like the UN). This increased our organic search traffic for the page by 800 times overnight. But we didn’t just drive more traffic to the page. Our deep keyword research around the core term water management helped us find and tell good stories about our efforts to help people more intelligently manage water. When we started listening to social media using the words our target audience used (in this case, primarily NGO and governmental operations managers, but also concerned citizens), we learned a lot about how we could help them solve their problems. This made the content rich with case studies, fascinating facts and figures, and ways concerned citizens could get involved to help their communities improve water quality and abundance. The seeds of our keyword research also grew into fruitful efforts outside of our ibm.com property. In our companion blog, we referenced lots of rich video content, such as the “mad scientist” who placed sensors up and down the Hudson River watershed and hooked them together into a system of data points to analyze as a whole. The system then identified points of impact to river quality that we could help alleviate. Even our Think Exhibit—a museum celebrating IBM’s centennial year (2011) in Lincoln Center—featured content along a massive wall of interconnected displays demonstrating how much water leaks out of New York City’s water supply every year. Hint: it’s a lot, but we’re helping the city find and stop the leaks. The right keyword research can inform the entire enterprise of content around a topic of interest to your company and its audiences. Keyword research is not just for search anymore, it’s a valuable tool for the whole of content strategy and beyond. Some people limit the concept of intelligent content to the information we can gather from our existing users on our site. This includes site search analytics, referral and click-stream data, user surveys and studies, etc. This is all very valuable. But it only measures content effectiveness for your existing audience. If you want to get a sense of what content will be effective for audiences that don’t even know about your site, you have to do external keyword research to learn it. For example, when we launched Smarter Planet, not many people knew IBM was engaged with NGOs and governments to help build smarter water management systems around the world. Nobody went to ibm.com looking for answers to these problems. So how could we learn to serve their needs better with site analytics if they never came to our site? When we did the external keyword research, using the steps outlined in the step-by-step section, and learned how they talked about their problems, we developed a content strategy for them. Because we built content to answer their questions and help them solve their problems, we gained a new engaged audience. Our task now is to replicate this method for all the audiences around the world who might need IBM’s help to solve their problems. To help educate the thousands of content creators, editors, and strategists in the company, three of us co-wrote a book, Audience Relevance and Search: Targeting Web Audiences with Relevant Content , to define a method for learning what’s relevant to the prospective audience through keyword research and social media listening. The method has been particularly popular within IBM for two reasons. The first is that our audience members are low on time and need our content to get to the point as concisely and clearly as possible. The same is true for most people online. The second is that we know site visitors typically use search to find content related to their interests, and ignore everything else. On ibm.com, more than 96% of our primary target audiences frequently or always uses search to find what they’re looking for. All these practices depend on good keyword research. We are building a master keyword database that can help practitioners create more relevant experiences for clients and prospects. 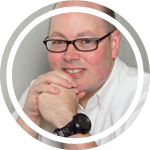 James Mathewson is the global search-and-content strategy lead for IBM. When he is not training teams on search-first content strategy, he primarily helps agile web dev teams in the IBM Digital Lab build content experiences for their audiences. His opinions are his own and not IBM’s. “Better Lures for New Audiences” appeared as a Feature Article in Issue #3. Issue illustration by Yesenia Perez-Cruz. Really liked that this piece gave time to the brand language, and the compromises necessary (e.g. at URL level) to bridge the gap between brand and user when the user language research comes after the branding people have chosen their terminology. Really useful piece :) Happy days. I’ve been doing some pre-reading before going to Confab next week, and I like that this article gives specific steps, tips, a case study, and additional resources. I’ve just added “Audience Relevance and Search” to my reading list. Thank you, James! This is the new SEO, the kind that bridges the gap between search keyword analysis and good content. Too often SEOs will use search keywords to crappify their content, rather than using those keywords to provide content that someone would actually want to read/use. When I read this, I realized I was reading something special. I immediately forwarded it to a few of my SEO/marketing friends because it offers a perspective that I really think needs to be clearly and thoughtfully understood. Props to Mr. Mathewson on pointing the way forward. Excellent info, James, and right on. Emily Warn, my business partner at Two Pens, curates the Microsoft Office blog and has been doing exactly what you discuss here: looking at the highest ranking search terms and creating content to address the customer’s questions and bottlenecks. It seems like a logical thing to do but not that many companies are doing it. Office blog traffic is up and those posts about highly ranked search terms are hitting the the customer’s need to know. Cool. And thanks to Dan Gayle above for pointing me to your article! Copyright © 2016 Contents Magazine and its authors. TinyLetter is a simple newsletter service for people with something to say.